This pest control and company specializes in killing termites. 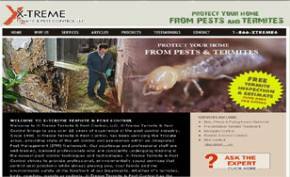 An Ecommerce website design was chosen because the company also sells different pest control products to consumers. Customers can browse, shop and view useful information on termites and other pests control methods and products.The website is easily maintained by the client via our user interface. X-Treme is based on Staten Island, New York. The New York web design by Bitochon brought new customers from surrounding areas as well as recommendations from those customers, much to the company’s delight. Consequently this led to the company’s growth.